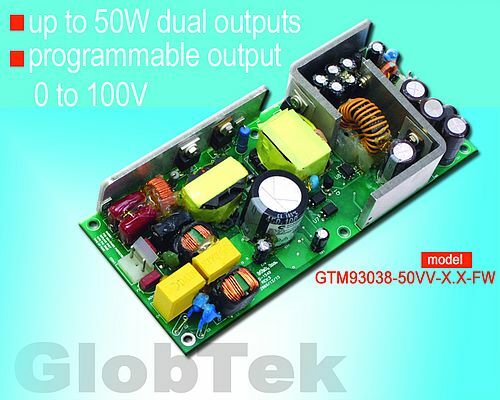 GlobTek announces its 50W dual output channel open frame internal power supply for Ultrasound equipment applications. The Dual output Switcher features a programmable VARIABLE 10VDC @2.6A TO100VDC @0.26A output as well as 12V 2A regulated output typically used for housekeeping or PWM. For applications employing 2 units in parallel, one or both may be wired for Negative voltage such as -10v to -100V. The output voltage control method is 0VDC TO 10VDC, control input impedance at least 10K OHM. The model is designed to latest North American national standard ANSI/AAMI ES60601-1 (3rd Edition). Specifically ANSI/AAMI ES60601-1 Issued: 2006/03/09: 2005 Version (R2012) with AMD C1: 2009, AMD C2: 2010 & CAN/CSA-C22.2 No.60601-1 Issued: 2008/02/01; with COR 2:2011/06/01). The model is also designed to meet CB and Semko to IEC 60601-1: 2005 + CORR. 1 (2006) + CORR. 2 (2007) and group and national differences for the CENELEC countries. The unit is CE Mark Certified to EN 60601-1-2:2007, EN 55022:2010, EN 61000-3-2:2006+A1:2009+A2:2009, EN 61000-3-3:2008, and EN 55024:2010.. The unit is 2MOPP. 2MOPP (means of patient protection) refers to two independent systems of insulation protecting the patient from dangerous voltages. A single insulating component can get this rating based on extensive testing. 2MOPP certifications exceed the requirements of 2MOOP and this unit may be used for either application.